In the pharmaceutical industry, the incorporation of the disciplines of pharma- kinetics, pharmacodynamics, and drug metabolism (PK/PD/DM) into various drug development processes has been recognized to be extremely important for approp- ate compound selection and optimization. During discovery phases, the identifi- tion of the critical PK/PD/DM issues of new compounds plays an essential role in understanding their pharmacological profiles and structure-activity relationships. Owing to recent progress in analytical chemistry, a large number of compounds can be screened for their PK/PD/DM properties within a relatively short period of time. During development phases as well, the toxicology and clinical study designs and trials of a compound should be based on a thorough understanding of its PK/PD/DM properties. During my time as an industrial scientist, I realized that a reference work designed for practical industrial applications of PK/PD/DM could be a very valuable tool for researchers not only in the pharmacokinetics and drug metabolism departments, but also for other discovery and development groups in pharmaceutical companies. This book is designed specifically for industrial scientists, laboratory assistants, and managers who are involved in PK/PD/DM-related areas. It consists of thirteen chapters, each of which deals with a particular PK/PD/DM issue and its industrial applications. Chapters 3 and 12 in particular address recent topics on higher throughput in vivo exposure screening and the prediction of pharmacokinetics in humans, respectively. 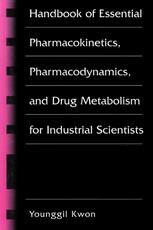 Chapter 8 covers essential information on drug metabolism for industrial scientists.